A friend just prodded me a wee bit - telling me that I had not posted anything here in 3 weeks! I could not believe that it could be true! Times flies when you're having fun I guess! The mixed media fairy did not leave me for long. I guess I just need to go with the flow and play where the spirit moves me to. I started making these little pins and when they were finished I made a few more just for fun. I like them! DH had asked me to make a retirement gift for someone he has known for many years. I had hoped that he was going to go along with the idea of a generous 'sofa' quilt, but he said that he wanted a full sized bed quilt. I had given up on a project that I had been working on for some time. I'd been making 25 patch blocks that just became too boring to continue with (see previous post here). 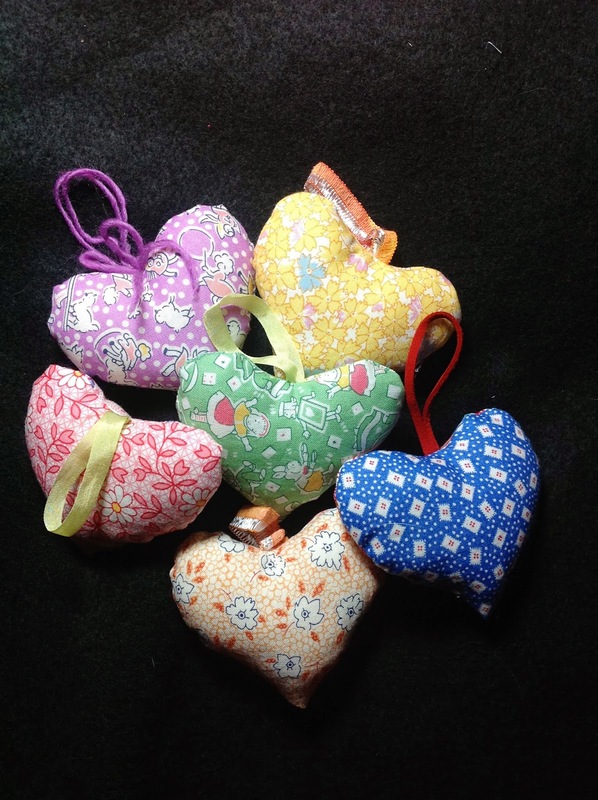 I had made quite a lot of them, but with a large quilt looming on the horizon I was very grateful to have a starting place so that all of that time and fabric would not go to waste. It's 106 X 90 now and almost ready to go to my favorite long arm quilter, Keri Stone of Orcas Island. I will get it finished by really squeaking the deadline - I hope that I will anyway. I know that Keri is going to turn this ho-hum top into a wonderful quilt! The thing is - that when you make a quilt that is going to someone else - that they have not chosen for themselves it's kind of scary. There are TWO other people in this equation, and I have no feel for what they would want. 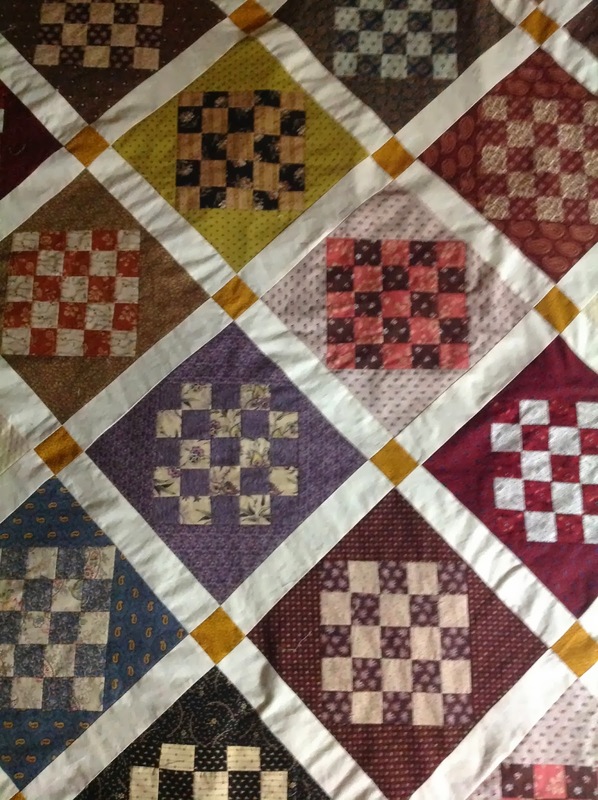 Traditional is perfect though as no one generally does not a traditional quilt to sleep under, and the colors will go with their 'country' themed home. 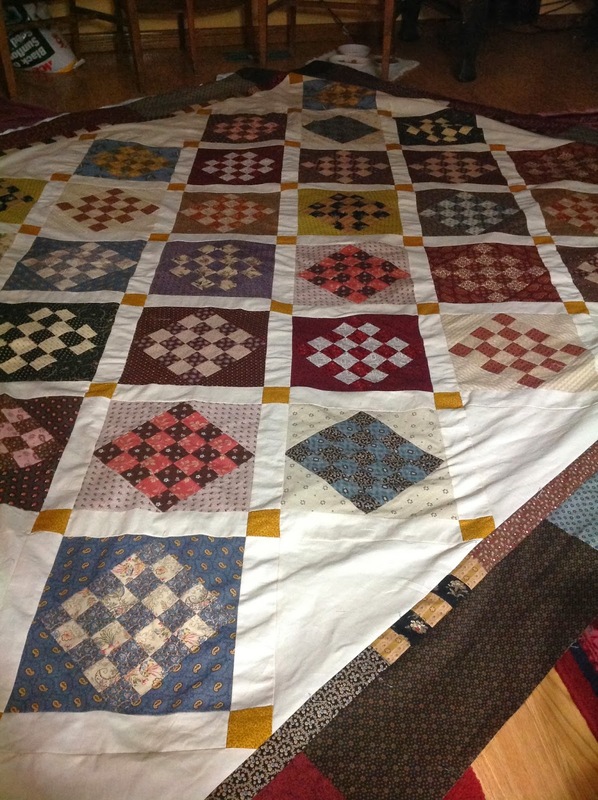 I love making art quilts, but I have to admit that I prefer to sleep under traditional quilts. How about you? Do you have any preference for what kind quilt you sleep under? 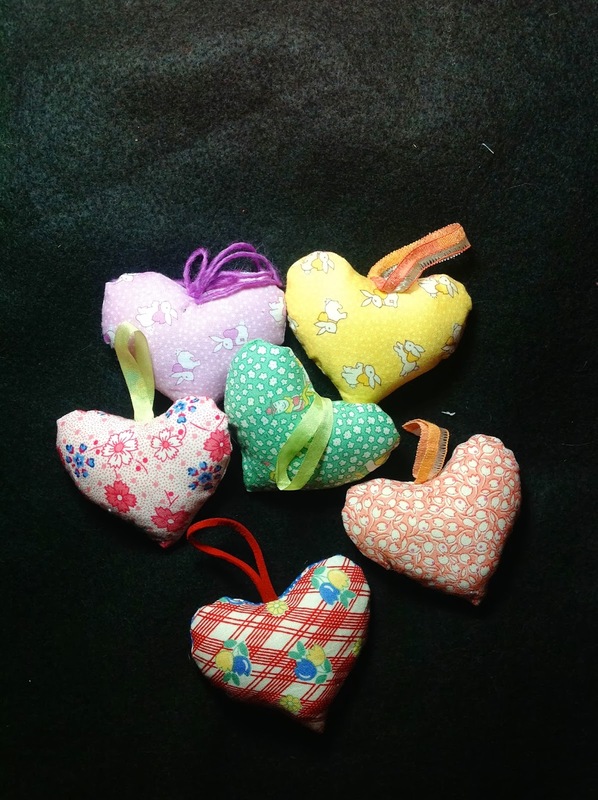 I got the bug to make some wool fleece filled pin cushions, and I had a great time making them! I think I will sell some. $10.00 a piece plus shipping - about 3". What do think about that pricing? I finished a small shawl that I had been working on using Cascade Souk yarn that is 55% silk and 45% wool. I love the long graduated colors, and although the pattern is almost too simple it will be a colorful antidote to the greyness of the skies. 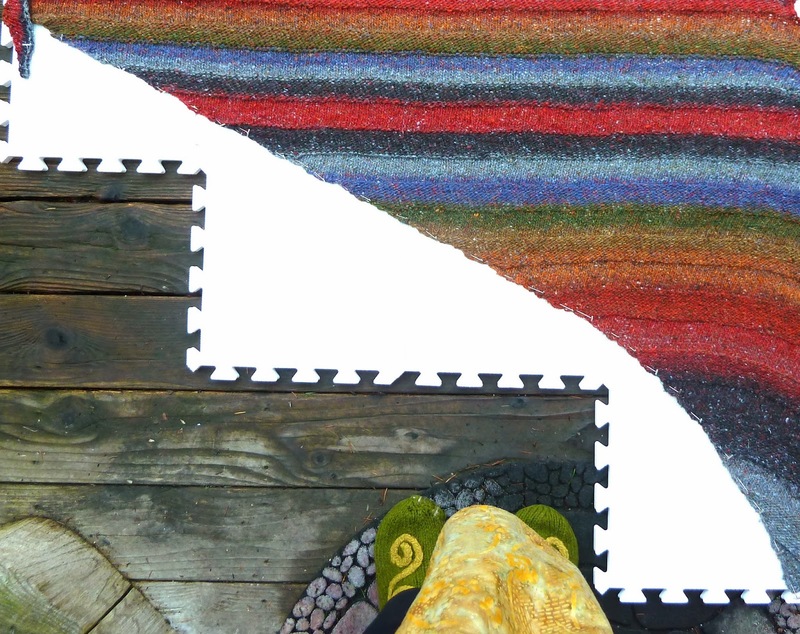 Below: Still on the blocking boards on a rain soaked deck. See how the color helps make all of that rain soaked grey look better?! So that's what I have been up to. I started another shawl too, but decided that I did not like the color combinations - so I ripped it all out. I'll start a new project this evening as I watch the Olympics. How has your week been? Or should I say how have your WEEKS been?! I always appreciate the friends who remind me I need to catch up on things! faith is a thing with wings! theses little pins are so timely and colorful. I too sleep under a traditional quilt, a 9 patch and snowball I made 20 plus years ago. what a generous retirement gift ! 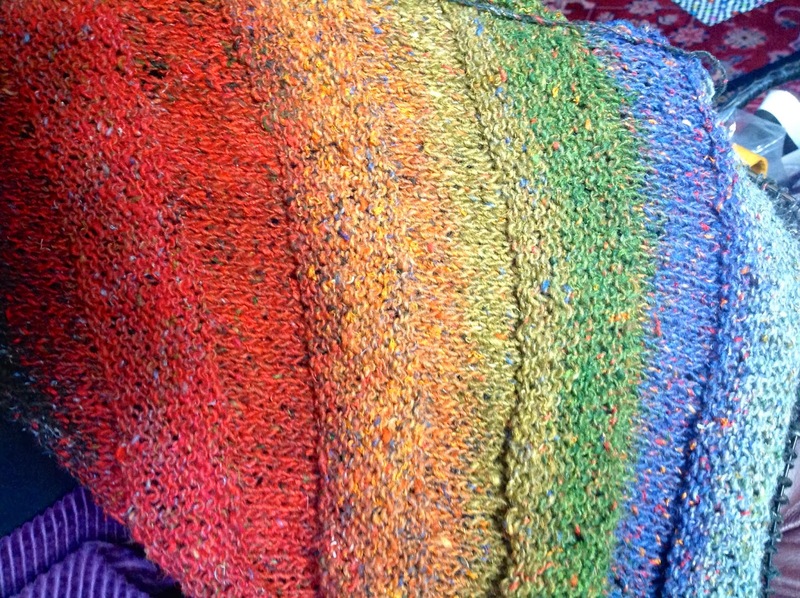 the colors in the shawl are so happy! Keep making! You know I still have a little pennant you made with the sun's face on it...and of course, my trusty purple fountain pen....put to good use. Your pins make my heart happy!!! They have so much personality. I sleep under antique quilts. I know some would shudder that I would throw a hundred year old quilt on my bed to be slept on by cats and tugged on by me, but I have gotten past the "precious". They were made to be used and I enjoy them so much better than folded up in a cupboard. That said, some are getting tired, so I have started making one (log cabin) using the same value of cloth to mimic the original. The retirement quilt is gorgeous!!! The shawl made me smile. I am so into color in the winter. I still have the twinkle lights up on the house and the faux Christmas tree is now a bird tree with a few hearts thrown in for the season. Anything to brighten up the gray gloom outside is allowed. Have a fabulous week!!! You are simply amazing! Love all that you are doing. While I love sleeping under a quilt, I would not call mine traditional even though it is simply half-square triangles. It is loud and colorful--purples and peaches. you have been busy... looks like you are having great fun! the pins are wonderful!! They should sell like hotcakes. Colorful, of course, meaningful, pretty. It's all great eye candy! I totally agree with you on the retirement quilt - it's a gamble when the recipient hasn't asked for it specifically. I deeply hope they appreciate how fabulous it is! Your hearts are terrific and the knitting is sublime! You're doing great things!